I love doctors. 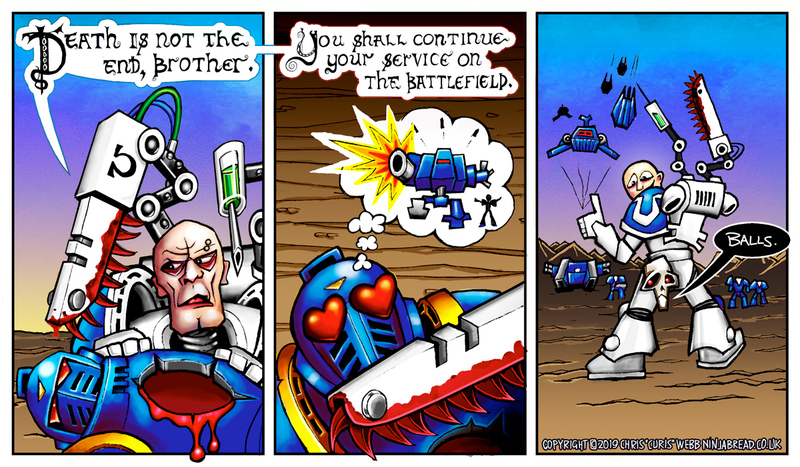 And I love Space Marines. 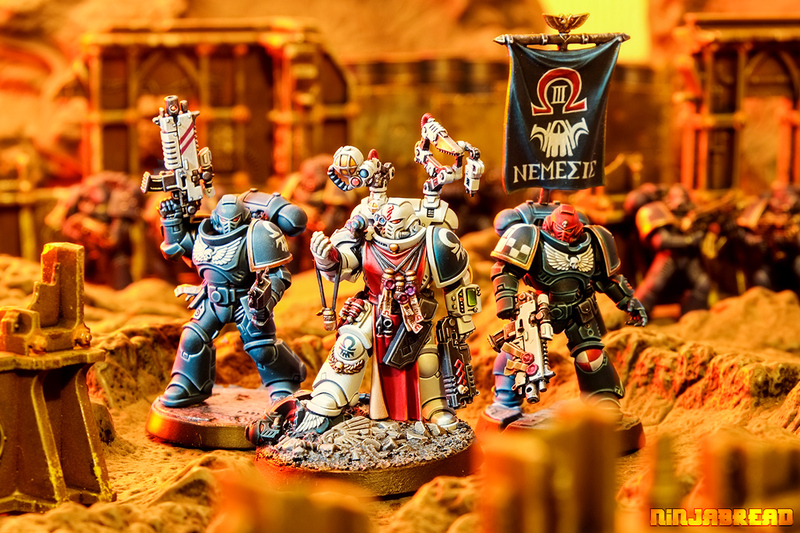 Put them together, and you get Doctor Space Marines, dispensing healthcare and the Emperor's justice across the battlefields of the 41st millennium. 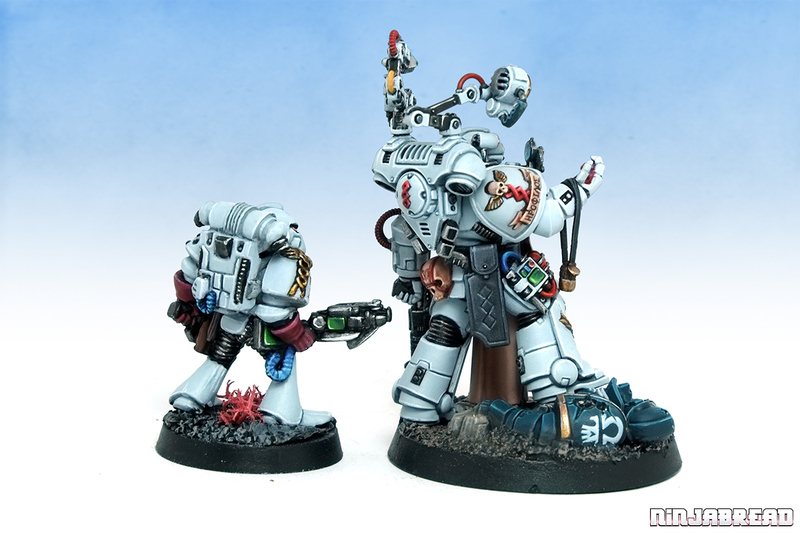 Here's the 2017 Primaris Apothecary alongside his very own primogenitor – the very first Apothecary miniature Games Workshop produced back in 1987. Oh, how far miniature design has come in thirty years. "Here child, have this necklace." "Dad, your bum is looking at me." 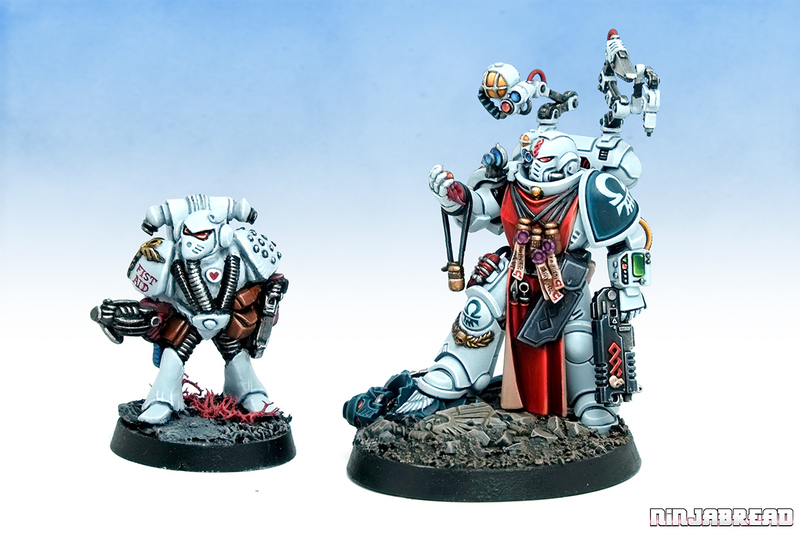 If you'd like to learn how to paint white exactly like this, I took super-detailed stage-by-stage photos on the Ninjabread Patreon, and have written up the method, colours and theory. 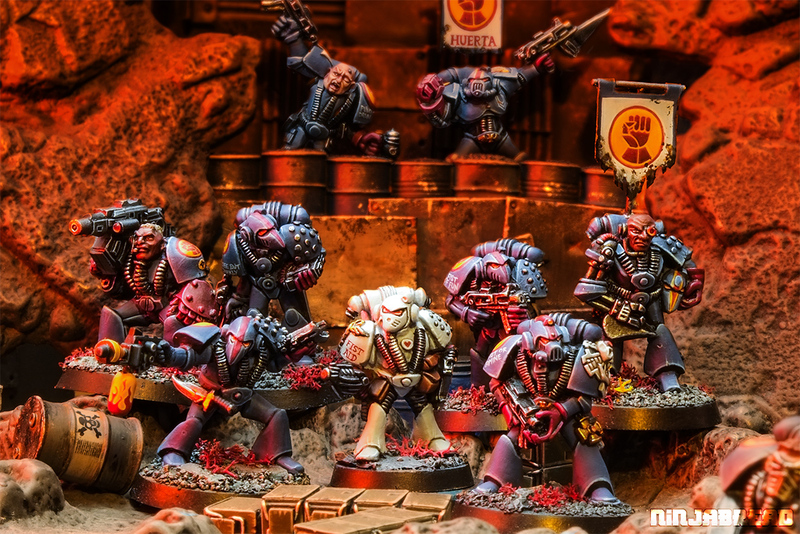 I'm really keen on collecting more Apothecaries now, and am taken by the idea of one with a Crimson Fists one with a bike or jump pack with "Fist Responder" armour graffiti. The sheet-metal walls you can see above are a preview casting of a Fogou Models terrain set that's coming soon! Keep your eyes peeled! 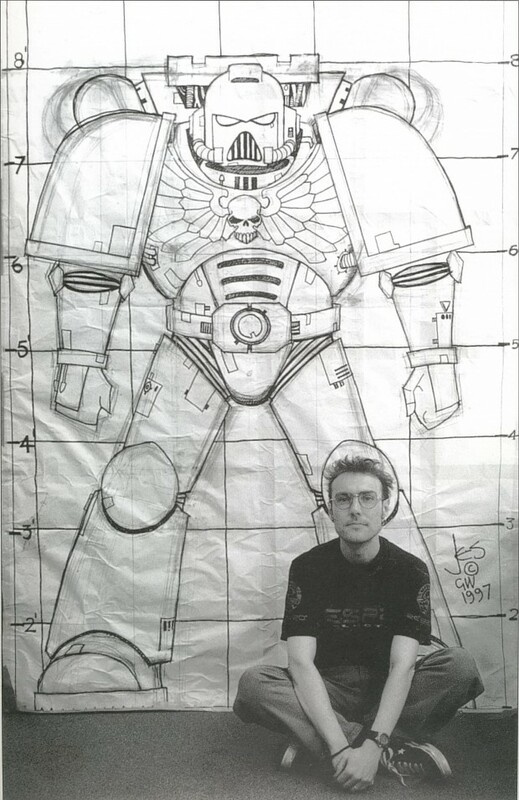 Woah, talk about scale creep! Not scale creep. Scale LEEP! These are obviously just mock ups of posters for an upcoming Kevin Hart Dwayne Johnson buddy film set in the 40k universe. One is hand cast Metal from a mould made from a hand sculpted master by some talented chap. The other is machine cast plastic from a presumable cg master engineered by some one who would rather be playing some computer game or other (I would love to be wrong on this one). 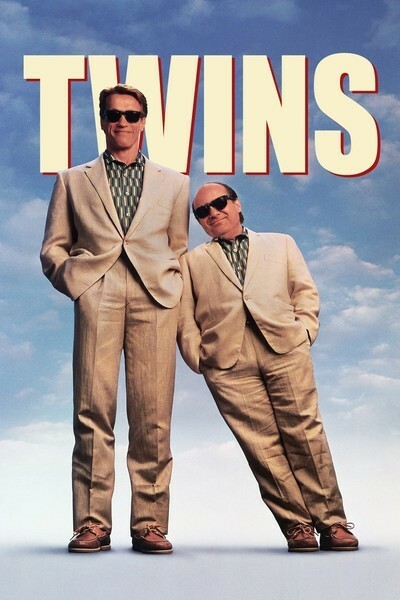 If they were the same size, the details would be more in line. Its like comparing 28 to 54mm. Of course 54 is usually more detailed, it's bigger! Inquisitor figures were (mostly) more detailed also, as they were bigger. Plus, being metal they had the option of having undercuts, some thing hips cannot (it's metal mould cannot bend, unlike silicon used to cast alloy). 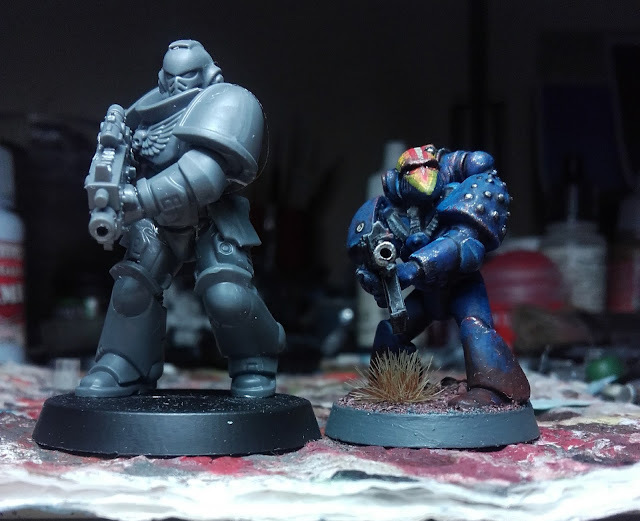 Fluffwise, the Primaris Marines are a head taller than their predecessors. 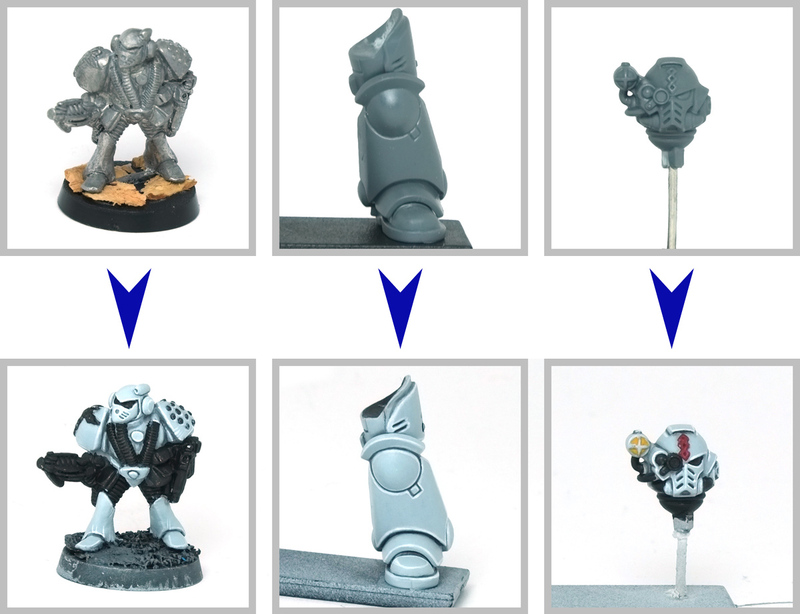 But the Primaris are honestly 'truescale Marines', since even the 3rd Edition plastic Marines were a head taller than the RTB01 Beakies. Going rococo is not always a virtue. I prefer the spartan look of the older figure. They were never supposed to be that big. Not sure how big the squares are supposed to be. Any ideas? Judging by numbers and size of Jess, squares are 12". The square's unit is a "head". Standard anatomical proportions guide. I suppose eldar defy the standard. I assume you mean that the head is a common measuring device. You are correct-ish regarding the poster. However it is not head size, it is helmet sized. Remember the marine is in a suit of armour, thus he is actually smaller than the armour. Uuuuh … I never noticed that about the squares not starting at 0'. Thanks Lion! 12" platform soles on their boots.